Now we, too, come near to that point in the Church’s year in which we welcome him, ‘who comes in the name of the Lord,’ echoing the very first acclamations in Jerusalem, and joining with Christians since at least the fourth century. 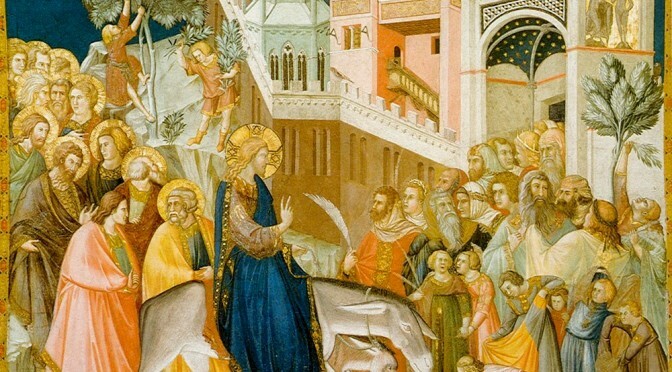 Yet Palm Sunday arrives with a mix of joy and confusion. Jesus met a crowd in Jerusalem who seemed ready to recognise him as their king; yet he rode in on a donkey. Not the most triumphant mode of transport; and the next few days followed a course nobody (except Jesus himself) expected. Who in that crowd would have guessed that the one who came into Jerusalem amidst shouts of praise would be put to death not long after? The Benedictus should remind us, all the year through, of the lowliness of Jesus’ human estate, and the hiddenness of his glory. Lent may be nearing its end, but the suffering of Jesus remains with us all year, even as we celebrate his resurrection and anticipate his glory each Sunday. As we live in him and he in us, we can expect a mix of joy and confusion in our lives as well. This is not bad news, however, for it is not the end: the end will come when the glory of the Lord (which fills heaven and earth!) is revealed — and his resurrection will at last be ours as well.